I decided when I started building my 3˜4 scale B9 to start from the top down. This is backwards of how many builders do it. Naturally the brain was the first thing I tackled. The usual method if lighting the brain is with flasher bulbs. However, I had some special problems to consider. First was the fact that incandescent bulbs generate a goodly amount of heat and my brain box was fashioned from acrylic. The heat from bulbs would warp or crack the plastic after some time. Second, I was concerned that the power supply I had scrounged up for my robot may not have adequate amperage if I used all incandescent bulbs. LEDs use little current, and generate almost no heat, especially when properly biased. The problem was getting them to blink in a pleasing manner. I have included the schematic I chose to use. It is fairly basic, and, while not random, it is very flexible. properly done can appear random except under scrutiny. LEDs are currently available in almost every basic color, giving you more than a few choices. I went with a multicolor scheme. To me, it was the most pleasing option. The circuit was constructed of a 555 timer IC, a 4017 decade counter/divider IC, and a handful of discreet supporting components. It was constructed on a solderable perf board, and measures about 2 inches on a side. The LEDs were mounted in 3 separate acrylic support rails, drilled with evenly spaced 5mm holes to mount the 28 T1 3˜4 LEDs. The 2 side rails have ten holes each, and the front rail has eight (shorter to accommodate the eye lights). The rails are mounted about 1˜4 inch behind the sides of the brain with a bead of goop. The LEDs are press fit into the holes, and soldered to a common ground buss line. 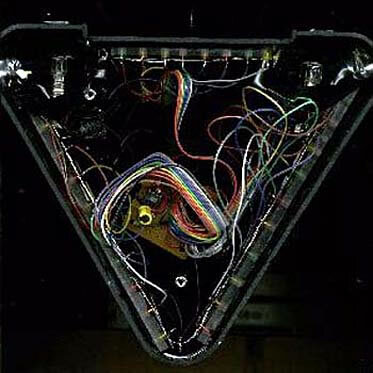 Individual LEDs are addressed by the outputs of the decade counter through rainbow ribbon cable. (I have included a scan of the actual brain wireing, however, it did not turn out as well as I would have liked.) The three separate sets of LEDs are wired in parallel, so one on each side flashes at a time. Since my scaled version could not accommodate a cam drive type device to animate the light rods, (couldnít find a suitable size motor) I decided to tap the first and last output lines to light LEDs mounted in the light rods. The effect is not as spectacular as moving light rods, but at least they are semi-functional. NOTES: R2 can be replaced with an adjustable resistor (trimmer or potentiometer) for a variable rate. The pattern of the display can be varied by changing the output lines to the display. Experiment on a solderless circuit board for the most pleasing effect. 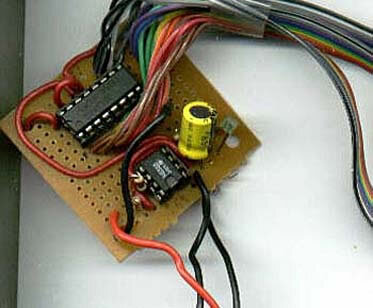 It is recommended that this (or any) circuit be tried out on a solderless board first, so component values can be selected or changed. The reason I specify any color except blue ore white is that these kinds of LEDs have a significantly higher forward voltage (3.2-3.7V) compared to other kinds of LEDs. While this circuit may be able to drive them without pull up transistors, I have not tested it for this. This circuit has been successfully tested to drive three full sets of LEDs in parallel, for a total of 30 LEDs, flashing 3 at a time. The datasheet on the 4017 states that it can handle up to 15Vdc, however, I have only tested this circuit up to 12V. The outputs of the 4017 could easily be used to drive 12V lamps with the addition of pull up transistors, however I have not included a diagram for this. The wiring for such is left to the builder.